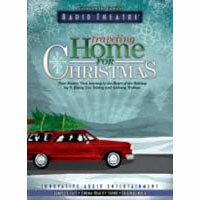 This Radio Theatre from Focus on the Family includes the classics "Shoemaker Martin" by Count Leo Tolstoy and "The Gift of the Magi" by O. Henry along with two other endearing dramas. "The Gift of the Magi" tells of two struggling newlyweds who each sell the one thing that they hold most dear in order to purchase the other a Christmas gift. In "Christmas By Injunction" a prospector who comes into some money decides to play Santa for his home town. "Shoemaker Martin" is Tolstoy's moving story of compassion, and the final tale, "Christmas Day at Kirkby Cottage," presents an unlikely romance. This production stars a complete cast of award-winning actors, including John Rhys-Davies ("Gimli" from The Lord of the Rings films). When youre Traveling Home for Christmas, let these heartwarming stories become a new family tradition. Adapted by Dave Arnold and Philip Glassborow.